MOST youngsters dream of becoming a famous footballer when they grow up. Not Jake Davis - he's decided on a much more dangerous sport. The 11-year-old motor racing fanatic has put all fears aside and is dreaming of becoming the next Lewis Hamilton. After receiving his first kart for Christmas in 2016, Jake joined the Llandow karting academy near Cardiff and took part in his first race in June 2017. The karting ace has just finished a great 2018 racing season which saw him become the 2018 South Wales Honda Cadet Champion as well as winning the Celtic Champion Trophy. He also made his MSA racing debut in November at the Clay Pigeon circuit in Yeovil where he finished as top novice. Jake has been attending the Formula 1 British Grand Prix at Silverstone for the last six years with both his grandfather and dad Paul, who are both huge motor racing fans. 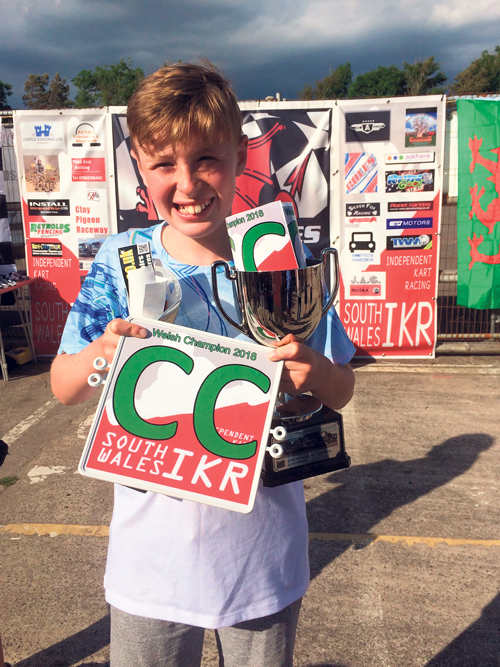 Jake, who splits his time between his dad in Downend and mum in South Wales, will now move up to a more powerful class, Rotax Minimax, as he prepares for this year's Nigel Mansell MSA Kart Club Championship and the South Wales IKR Club and Celtic Championship. Paul said: "Jake has always been a keen sports person, playing for Mangotsfield junior teams and many other sports at school but his ultimate ambition is to go as far in motorsport as he can. "He's a massive fan of Formula 1 and watches all the races, supporting his hero Lewis Hamilton. He would love to drive for the McLaren Formula 1 team." It seems sporting prowess runs in the family - Jake's nine-year-old brother Finley is goalkeeper for both Cardiff City FC development U10 squad and Coalpit Heath. Paul said: "I'm extremely proud of Jake and his younger brother Finley. We all love sport, with all its highs and lows, and all regularly attend and support Bristol City and Bristol Rugby. "They both are so ambitious and driven at a young age. It's brilliant to see that they are prepared to work so hard to try and achieve their dreams and you never know with hard work and a bit of luck, they might come true." Paul, who acts as his son's mechanic, said Jake is now looking for sponsorship to help him achieve his ambition. "Although Jake would love to be a Formula 1 driver, it is an expensive sport and is a struggle with no sponsors. With more financial support he could achieve greater success." If you are interested in sponsoring Jake during 2019 and beyond or would like to start karting yourself, please contact Paul Davis on 07929 029083.